The Guardian News commentary -- nuclear war Why Hasn't There Been A Nuclear War? Why Hasn't There Been A Nuclear War? 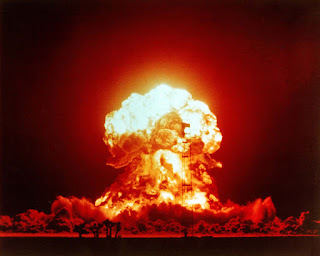 Amos Zeeberg, Nautilus: Why Hasn’t the World Been Destroyed in a Nuclear War Yet? When opposing nations gained access to nuclear weapons, it fundamentally changed the logic of war. You might say that it made questions about war more cleanly logical—with nuclear-armed belligerents, there are fewer classic military analyses about morale, materiel, and maneuverings. Hundreds of small-scale tactical decisions dissolve into a few hugely important large-scale strategic ones, like, What happens if one side drops a nuclear bomb on its nuclear-armed opponent? Using a dangerous weapon like a nuclear bomb can of course provoke dangerous responses. If one country crosses the nuclear line, what will its opponent do? What will its allies, or other nuclear-armed states do? The decision to use a nuclear weapon is practically nothing next to the chain reaction it begins. The act of one nation simply developing a nuclear weapon can provoke a “nuclear proliferation cascade,” as other nations, concerned about new nuclear-armed rivals, rush to follow suit. This is cited as one reason why it’s so important to prevent Iran from building its own nuclear weapons. WNU Editor: Mankind since Hiroshima and Nagasaki has been incredibly lucky.